Join us for a dance celebration at our last Bailemos at the Sadler’s Wells of 2013. The program is aimed to give you a taste of the dance world and expand your dance experience as a whole. Sadler’s Wells exclusive back stage studio is the perfect place for this unique Fiesta. What is it? take a fresh look at musicality. We will learn sequences to fit perfectly musically a traditional Tango or Vals song you all know. The focus is on the musicality of your moves, with some decorations to emphasise the accents and keys in the music, allowing you to look at it with new eyes. By the end of the sessions you will all be dancing simultaneously a 3 minutes choreography. This is a fresh, and challenging way to look at developing your sense of musicality, while being accessible to all. It will help broaden your range so you can then use it in your social dancing too. 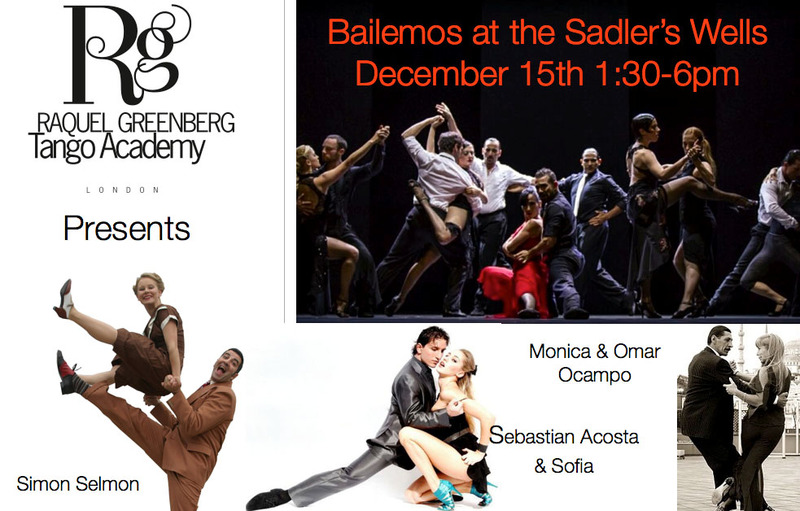 Following the success of the newest tango production of Sidi Larbi show “Milonga” recently presented at the Sadler’s Wells, I am excited to have one of its star couples, Sebastian Acosta and Sofia perform one of their complex choreographies just for us. They will be in rehearsals clothes for us to see it from a close look and observe how they work it all out in a rehearsal – just as they were practicing in back stage few weeks ago before going on stage at the Sadler’s Wells.